COP21 in Paris is over. Now it’s back to the hard work of fighting for, and implementing, the energy transition. We all know that the transition away from fossil fuels is key to maintaining a livable planet. Several organizations have formulated proposals for transitioning to 100 percent renewable energy; some of those proposals focus on the national level, some the state level, while a few look at the global challenge. David Fridley (staff scientist of the energy analysis program at Lawrence Berkeley Laboratory) and I have been working for the past few months to analyze and assess many of those proposals, and to dig deeper into energy transition issues—particularly how our use of energy will need to adapt in a ~100 percent renewable future. We have a book in the works, titled Our Renewable Future, that examines the adjustments society will have to make in the transition to new energy sources. We started this project with some general understanding of the likely constraints and opportunities in this transition; nevertheless, researching and writing Our Renewable Future has been a journey of discovery. Along the way, we identified not only technical issues requiring more attention, but also important implications for advocacy and policy. What follows is a short summary—tailored mostly to the United States—of what we’ve learned, along with some recommendations. Germany has arguably accomplished more toward the transition than any other nation largely because it has a plan—the Energiewende. This plan targets a 60 percent reduction in all fossil fuel use (not just in the electricity sector) by 2050, achieving a 50 percent cut in overall energy use through efficiency in power generation (fossil fueled power plants entail huge losses), buildings, and transport. It’s not a perfect plan, in that it really should aim higher than 60 percent. But it’s better than nothing, and the effort is off to a good start. Although the United States has a stated goal of generating 20 percent of its electricity from renewable sources by 2030, it does not have an equivalent official plan. Without it, we are at a significant disadvantage. What would a plan do? It would identify the low-hanging fruit, show how resources need to be allocated, and identify needed policies. We would of course need to revise the plan frequently as we gained practical experience (as Germany is doing). What follows are some components of a possible plan, based on work already done by many researchers in the United States and elsewhere; far more detail (with timelines, cost schedules, and policies) would be required for a fleshed-out version. It groups tasks into levels of difficulty; work would need to commence right away on tasks at all levels of difficulty, but for planning purposes it’s useful to know what can be achieved relatively quickly and cheaply, and what will take long, expensive, sustained effort. Electricity accounts for less than a quarter of all final energy used in the U.S. What about the rest of the energy we depend on? Since solar, wind, hydro, and geothermal produce electricity, it makes sense to electrify as much of our energy usage as we can. For example, we could heat and cool most buildings with electric air-source heat pumps (replacing natural gas- or oil-fueled furnaces). We could also begin switching out all our gas cooking stoves with electric stoves. Transportation represents a large swath of energy consumption, and personal automobiles account for most of that. We could reduce oil consumption substantially if we all drove electric cars (replacing 250 million gasoline-fueled automobiles will take time and money, but will eventually result in energy and financial savings). But promoting walking, bicycling, and public transit will take much less time and investment, and be far more sustainable in the long-term. Buildings will require substantial retrofitting for energy efficiency (this will again take time and investment, but will offer still more opportunities for savings). Building codes should be strengthened to require net-zero energy or near-net-zero-energy performance for new construction. More energy-efficient appliances will also help. The food system is a big energy consumer, with fossil fuels used in the manufacturing of fertilizers, in food processing, and transportation. We could reduce a lot of that fuel consumption by increasing the market share of organic, local foods. While we’re at it, we could begin sequestering enormous amounts of atmospheric carbon in topsoil by promoting farming practices that build soil rather than deplete it. If we got a good start in all these areas, we could achieve at least a 40 percent reduction in carbon emissions in ten to twenty years. Solar and wind technologies have a drawback: they provide energy intermittently. When they become dominant within our overall energy mix, we will have to accommodate that intermittency in various ways. We’ll need substantial amounts of grid-level energy storage as well as a major grid overhaul to get the electricity sector to 80 percent renewables (thereby replacing natural gas in electricity generation). We’ll also need to start timing our energy usage to better coincide with the availability of sunlight and wind energy. That in itself will present both technological and behavioral hurdles. Electric cars aside, the transport sector will require longer-term and sometimes more expensive substitutions. We could reduce our need for cars (which require a lot of energy for their manufacture and de-commissioning) by densifying our cities and suburbs and reorienting them to public transit, bicycling, and walking. We could electrify all motorized human transport by building more electrified public transit and intercity passenger rail links. Heavy trucks could run on fuel cells, but it would be better to minimize trucking by expanding freight rail. Transport by ship could employ modern fsails to increase fuel efficiency (this is already being done on a tiny scale), but re-localization or de-globalization of manufacturing would be a necessary co-strategy to reduce the need for shipping. Much of the manufacturing sector already runs on electricity, but there are exceptions—and some of these will offer significant challenges. Many raw materials for manufacturing processes either are fossil fuels (feedstocks for plastics and other petrochemical-based materials including lubricants, paints, dyes, pharmaceuticals, etc.) or currently require fossil fuels for mining and/or transformation (e.g., most metals). Considerable effort will be needed to replace fossil fuel-based materials and to recycle non-renewable materials more completely, significantly reducing the need for mining. Doing away with the last 20 percent of our current fossil fuel consumption is going to take still more time, research, and investment—as well as much more behavioral adaptation. Just one example: we currently use enormous amounts of cement for all kinds of construction activities. Cement making requires high heat, which could theoretically be supplied by sunlight, electricity, or hydrogen—but that will entail a nearly complete redesign of the process. While with Level One we began a shift in food systems by promoting local organic food, driving carbon emissions down further will require finishing that job by making all food production organic, and requiring all agriculture to sequester carbon through building topsoil. Eliminating all fossil fuels in food systems will also entail a substantial re-design of those systems to minimize processing, packaging, and transport. The communications sector—which uses mining and high heat processes for the production of phones, computers, servers, wires, photo-optic cables, cell towers, and more—presents some really knotty problems. The only good long-term solution in this sector is to make devices that are built to last a very long time and then to repair them and fully recycle and re-manufacture them when absolutely needed. The Internet could be maintained via the kinds of low-tech, asynchronous networks now being pioneered in poor nations, using relatively little power. Back in the transport sector: we’ve already made shipping more efficient with sails in Level Two, but doing away with petroleum altogether will require costly substitutes (fuel cells or biofuels). One way or another, global trade will have to shrink. There is no good drop-in substitute for aviation fuels; we may have to write off aviation as anything but a specialty transport mode. Planes running on hydrogen or biofuels are an expensive possibility, as are dirigibles filled with (non-renewable) helium, any of which could help us maintain vestiges of air travel. Paving and repairing roads without oil-based asphalt is possible, but will require an almost complete redesign of processes and equipment. The good news is that if we do all these things, we can get to beyond zero carbon emissions; that is, with sequestration of carbon in soils and forests, we could actually reduce atmospheric carbon with each passing year. Plans will look different in each country, so each country (and each state) needs one. These two energy resources have been the subjects of most of the discussion surrounding the renewable energy transition. Prices are falling, rates of installation are high, and there is a large potential for further growth. 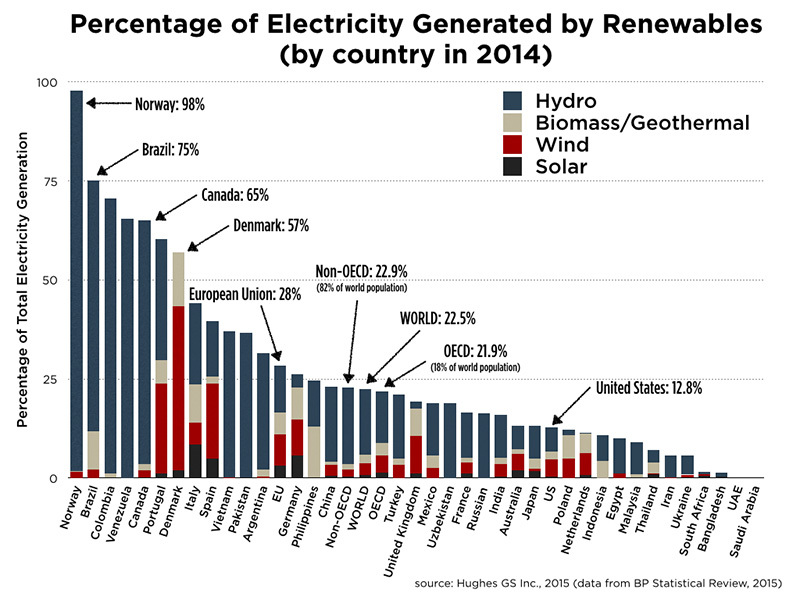 But, with a small number of exceptions, hydropower continues to serve as the largest source of renewable electricity. The inherent intermittency of wind and solar power will pose increasing challenges as percentage levels of penetration into overall energy markets increase. Other renewable energy sources—hydropower, geothermal, and biomass—can more readily supply controllable baseload power, but they have much less opportunity for growth. Hopes for high levels of wind and solar are therefore largely driven by the assumption that industrial societies can and should maintain very high levels of energy use. If energy usage in the United States could be scaled back significantly (70 to 90 percent) then a reliable all-renewable energy regime becomes much easier to envision and cheaper to engineer—but the system would need to look very different. Solar and wind would serve as significant sources of electricity and with usage timed to its availability, but hydro, geothermal, and some biomass (when environmentally appropriate) would serve as baseload power. It is unclear how much energy will be available to society at the end of the transition: there are many variables (including rates of investment and the capabilities of renewable energy technology without fossil fuels to back them up and to power their manufacture, at least in the early stages). Nevertheless, given all the challenges involved, it would be prudent to assume that people in wealthy industrialized countries will have less energy (even taking into account efficiencies in power generation and energy usage) than they would otherwise have, assuming a continuation of historic growth trends. According to the IPCC’s Synthesis Report, no more than 1,000 billion tonnes (1,000 Gt) of CO2 can be emitted between 2011 and 2100 for a 66% chance (or better) of remaining below 2 °C of warming (over preindustrial times)… However, between 2011 and 2014 CO2 emissions from energy production alone amounted to about 140 Gt of CO2… [Subtracting realistic emissions budgets for deforestation and cement production,] …the remaining budget for energy-only emissions over the period 2015–2100, for a ‘likely’ chance of staying below 2 °C, is about 650 Gt of CO2. That 650 gigatons of carbon amounts to less than 19 years of continued business-as-usual emissions from global fossil energy use. The notion that the world could make a complete transition to alternative energy sources, using only that six-year fossil energy budget, and without significant reduction in overall energy use, might be characterized as optimism on a scale that stretches credulity. The “how much will we have?” question reflects an understandable concern to maintain current levels of comfort and convenience as we switch energy sources. But in this regard it is good to keep ecological footprint analysis in mind. According to the Global Footprint Network’s Living Planet Report 2014, the amount of productive land and sea available to each person on Earth in order to live in a way that’s ecologically sustainable is 1.7 global hectares. The current per capita ecological footprint in the United States is 6.8 global hectares. Asking whether renewable energy could enable Americans to maintain their current lifestyle is therefore equivalent to asking whether renewable energy can keep us living unsustainably. The clear answer is: only temporarily, if at all . . . so why attempt the impossible? We should aim for a sustainable level of energy and material consumption, which on average is significantly lower than at present. Efforts to pre-adapt to shrinking energy supplies have understandably gotten a lot less attention from activists than campaigns to leave fossil fuels in the ground, or to promote renewable energy projects. But if we don’t give equal thought to this bundle of problems, we will eventually be caught short and there will be significant economic and political fallout. So what should we do to prepare for energy reduction? Look to California: its economy has grown for the past several decades while its per capita electricity demand has not. The state encouraged cooperation between research institutions, manufacturers, utilities, and regulators to figure out how to keep demand from growing by changing the way electricity is used. This is not a complete solution, but it may be one of the top success stories in the energy transition so far, rivaling that of Germany’s Energiewende. It should be copied in every state and country. Current policy makers see increased buying and discarding of industrial products as a solution to the problem of stagnating economies. With nearly 70 percent of the United States economy tied to consumer spending, it is easy to see why consumption is encouraged. Historically, the form of social and economic order known as consumerism largely emerged as a response to industrial overproduction—one of the causes of the Great Depression—which in turn resulted from an abundant availability of cheap fossil energy. Before and especially after the Depression and World War II, the advertising and consumer credit industries grew dramatically as a means of stoking product purchases, and politicians of all political persuasions joined the chorus urging citizens to think of themselves as “consumers,” and to take their new job description to heart. If the transition to renewable energy implies a reduction in overall energy availability, if mobility is diminished, and if many industrial processes involving high heat and the use of fossil fuels as feedstocks become more expensive or are curtailed, then conservation must assume a much higher priority than consumption in the dawning post-fossil-fuel era. If it becomes more difficult and costly to produce and distribute goods such as clothing, computers, and phones, then people will have to use these manufactured goods longer, and repurpose, remanufacture, and recycle them wherever possible. Rather than a consumer economy, this will be a conserver economy. The switch from one set of priorities and incentives (consumerism) to the other (conservation) implies not just a major change in American culture but also a vast shift in both the economy and in government policy, with implications for nearly every industry. If this shift is to occur with a minimum of stress, it should be thought out ahead of time and guided with policy. We see little evidence of such planning currently, and it is not clear what governmental body would have the authority and capacity to undertake it. Nor do we yet see a culture shift powerful and broad-based enough to propel policy change. The renewable economy will likely be slower and more local. Economic growth may reverse itself as per capita consumption shrinks; if we are to avert a financial crash (and perhaps a revolution as well) we may need a different economic organizing principle. In her recent book on climate change, This Changes Everything, Naomi Klein asks whether capitalism be preserved in the era of climate change; while it probably can (capitalism needs profit more than growth), that may not be a good idea because, in the absence of overall growth, profits for some will have to come at a cost to everyone else. And this is exactly what we have been seeing in the years since the financial crash of 2008. The idea of a conserver economy has been around at least since the 1970s, and both the European degrowth movement and the leaders of the relatively new discipline of ecological economics have given it a lot of thought. Their insights deserve to be at the center of energy transition discussions. A discussion of population might seem off-topic. But if energy and materials (which represent embodied energy) are likely to be more scarce in the decades ahead of us, population growth will mean even less consumption per capita. And global population is indeed growing: on a net basis (births minus deaths) we are currently adding 82 million humans to the rolls each year, a larger number than at any time in the past, even if the rate of growth is slowing. Population growth of the past century was enabled by factors—many of which trace back to the availability of abundant, cheap energy and the abundant, cheap food that it enabled—that may be reaching a point of diminishing returns. Policy makers face the decision now of whether to humanely reduce population by promoting family planning and by public persuasion—by raising the educational level of poor women around the world and giving women full control over their reproductive rights—or to let nature deal with overpopulation in unnecessarily brutal ways. For detailed recommendations regarding population matters, consult population organizations such as Population Institute and Population Media Center. Population is a climate issue. Our analysis suggests that industrial societies will need to keep using fossil fuels for some applications until the very final stages of the energy transition—and possibly beyond, for non-energy purposes. Crucially, we will need to use fossil fuels (for the time being, anyway) for industrial processes and transportation needed to build and install renewable energy systems.We will also need to continue using fossil fuels in agriculture, manufacturing, and general transportation, until robust renewable energy-based technologies are available. This implies several problems. As the best of our remaining fossil fuels are depleted, society will by necessity be extracting and burning ever lower-grade coal, oil, and natural gas. We see this trend already far advanced in the petroleum industry, where virtually all new production prospects involve tight oil, tar sands, ultra-heavy oil, deepwater oil, or Arctic oil—all of which entail high production costs and high environmental risk as compared to conventional oil found and produced during the 20th century. Burning these heavier, dirtier fuels will create ever more co-pollutants that have a disproportionate health impact and burden on low-income communities. The fact that the fossil fuel industry will require ever-increasing levels of investment per unit of energy yielded has a gloomy implication for the energy transition: society’s available capital will have to be directed toward the deteriorating fossil fuel sector to maintain current services, just as much more capital is also needed to fund the build-out of renewables. Seemingly the only way to avoid this trap would be to push the energy transition as quickly as possible, so that we aren’t stuck two or three decades from now still dependent on fossil fuels that, by then, will be requiring so much investment to find and extract that society may not be able to afford the transition project. But there’s also a problem with accelerating the transition too much. Since we use fossil fuels to build the infrastructure for renewables, speeding up the transition could mean an overall increase in emissions—unless we reduce other current uses of fossil fuels. In other words, we may have to deprive some sectors of the economy of fossil fuels before adequate renewable substitutes are available, in order to fuel the transition without increasing overall greenhouse gas emissions. This would translate to a reduction in overall energy consumption and in the economic benefits of energy use (though money saved from conservation and efficiency would hopefully reduce the impact), and this would have to be done without producing a regressive impact on already vulnerable and economically disadvantaged communities. We may be entering a period of fossil fuel triage. Rather than allocating fossil fuels simply on a market basis (those who pay for them get them), it may be fairer, especially to lower-income citizens, for government (with wartime powers) to allocate fuels purposefully based on the strategic importance of the societal sectors that depend on them, and on the relative ease and timeliness of transitioning those sectors to renewable substitutes. Agriculture, for example, might be deemed the highest priority for continued fossil fuel allocations, with commercial air travel assuming a far lower priority. Perhaps we need not just a price on carbon, but different prices for different uses. We see very little discussion of this prospect in the current energy policy literature. Further, few governments even currently acknowledge the need for a carbon budget. The political center of gravity, particularly in the United States, will have to shift significantly before decision makers can publicly acknowledge the need for fossil fuel triage. As fossil fuels grow more costly to extract, there may be ever-greater temptation to use our available energy and investment capital merely to maintain existing consumption patterns (likely for the rich above all), and to put off the effort that the transition implies. If we do that, we will eventually reap the worst of all possible outcomes—climate chaos, a gutted economy, and no continuing wherewithal to build a bridge to a renewable energy future. The ability to harness energy creates wealth and confers social power. With the advent of fossil fuels came a rush of wealth and power such as the world had never before seen. Naturally, humanitarians saw this as an opportunity to spread wealth and power around so as to lift all of humanity above drudgery, eliminate hunger, and even put an end to war. And to a large degree that opportunity has been seized: overall, child mortality rates are down, life expectancy is up, infectious diseases are on the decline, hunger has been reduced (even as population has dramatically grown), and mortality from violence has declined since the end of World War II. Yet globally, wealthy industrial nations have disproportionately benefitted from the fossil fuel revolution while poorer nations have disproportionately borne the costs. And a similar disparity also exists within nations, both rich and poor ones. Further, the injustice of energy wealth vs. energy poverty is increasingly magnified by climate impacts, which fall disproportionately upon energy poor societies—both because of geographical happenstance and because they do not have the same level of resources to devote toward adaptation. Now we arrive at a crossroads, where the wealth-generating energy sources of the past two centuries (fossil fuels) must give way to different energy sources. While the decades ahead may see declining per capita energy consumption in the industrialized world, the transition to renewable energy does not automatically herald a more egalitarian future. Entrenched economic interests that benefited disproportionately during the fossil fuel era may seek to maintain their advantages as everyone else adjusts to lower consumption levels, attempting to ensure that their slice of a diminishing pie is left untouched. It is also possible that nations, and wealthy communities within nations, will build robust, largely self-contained renewable energy systems while everyone else continues to depend upon increasingly dysfunctional and expensive electricity grids that are increasingly starved of fuel. In either case, current levels of economic inequality could persist or worsen. Pursuing the renewable energy transition without equity in mind would likely doom the entire project. Unless the interests of people at lower economic levels are taken into account and existing inequalities are reduced, the inevitable stresses accompanying this all-encompassing societal transformation could result in ever-deeper divisions both between and within nations, and lead to open conflict. On the other hand, if everyone is drawn into a visionary project that entails shared effort as well as shared gains, the result could be overwhelmingly beneficial for all of humanity. This is true, of course, not only for the renewable energy transition but also for our response to impacts of climate change that are by now unavoidable. Consider, for example, the supply chain analysis for wind turbines. The graphic above shows the various components, each with its own manufacturing sector somewhere in the world. Planning will need to take such interdependencies into account. As every ecologist knows, you can’t do just one thing. Energy transitions change everything. From a public relations standpoint, it may be helpful to give politicians or the general public the impression that life will go on as before while we unplug coal power plants and plug in solar panels, but the reality will probably be quite different. During historic energy transitions, economies and political systems underwent profound metamorphoses. There is no reason to suppose that it will be different this time around. If this is done right, the changes that must take place will bring with them opportunities for societal improvement and the greater wellbeing of everyone—including the rest of the biosphere. For every answer David Fridley and I identified to the problem of how to power a modern industrial society with 100 percent renewable energy, it seemed that one or more questions popped up. For example, a massive deployment of electric cars would drastically reduce our dependence on oil—but how will we make electric cars without fossil fuels for plastics and tires? The high temperatures for industrial processes used to make glass and steel for those cars could be supplied by renewable electricity, but at what price? And how will we build and repair roads? Studies showing an easy and affordable path to 100 percent renewable energy typically have an agenda with which we entirely concur: the transition away from fossil fuels and toward renewable energy must occur, whatever the roadblocks. Some of those roadblocks take the form of simple inertia: companies—indeed, whole societies—will invest in fundamental changes to their ways of doing business only when they have to, and most are quite comfortable with their current fossil-fuel-dependent processes, supply chains, and of course sunk costs. Studies claiming that a transition to renewable energy will be easy and cost-free may allay fears and thus help speed the transition. However, sweeping actual difficulties under the carpet also delays confronting them. We need to start now to address the problems of energy demand adaptation, of balancing intermittency in energy supply from solar and wind, and of energy substitution in thousands of industrial processes. Those are big jobs, and ignoring them won’t make them go away. If many of the unknowns in the renewable energy transition imply roadblocks and speed bumps, some could turn out to be opportunities, and we cheerfully acknowledge that many conundrums may be much more easily solved than currently appears likely. For example, it is conceivable that new technical advances could result in a zero-carbon cement that is cheaper to make than the current carbon-intensive variety. But that’s extremely unlikely to happen until serious attention is given to the problem. At the end of the renewable energy transition, if it is successful, we will achieve savings in ongoing energy expenditures needed for each increment of economic production, and we may be rewarded with a quality of life that is acceptable and perhaps preferable over our current one (even though, for most Americans, material consumption will be scaled back from its current unsustainable level). We will get a much more stable climate than would otherwise be the case, along with greatly reduced health and environmental impacts from energy production activities. But the transition will entail costs—in terms of money, regulation, and the requirement to change our behavior and expectations. And delay would be fatal. Below are some suggestions geared specifically to environmental nonprofits and funders. Create social momentum to support a global powerdown, helping prepare society for an effort and a shift as huge as the Industrial Revolution. While the concern about providing opponents with ammunition is understandable, downplaying or ignoring the real implications of the energy transition may not only engender distrust, it might also waste an opportunity to provide people with a sense of agency. Where key uses of fossil fuels are especially hard to substitute (aviation fuel, for example), argue for work-arounds (such as rail) or for the managed, gradual scaling down of those uses. Explore how the transition could provide satisfying livelihoods and support thriving localized, steady state, circular economies. The Transition Network has already given considerable thought to this. Organizations of young organic farmers (like Greenhorns) and farmer training services (like the Agriculture and Land-Based Training Association), are only scratching the surface of what is needed. The Business Alliance for Local Living Economies is providing networking services for sustainable enterprises, but could perhaps provide more of a training function, if it were supported to do so. Take a leadership role in initiating visionary projects to further the energy transition, then enlist communities to take those projects on, and to benefit from them. These could be renewable energy, local food, transport, import substitution, recycling, or energy efficiency projects—the possibilities are nearly endless. Advocate for a just transition to renewable energy that benefits all people and communities. If the NGO world doesn’t do this, who will? And without such advocacy, the energy transition could actually exacerbate existing inequity. Efforts to educate and inspire citizens about the energy transition. Projects that involve development of new economic models that enable people to live with less energy, but in ways that bring greater life satisfaction. Replicable models of community development that include taking charge of local energy production and reducing fossil fuel demand across many sectors. The technical coordination of the renewable transition is itself an enormous task, and currently nobody is handling it. It will likely require a global authority to determine how to direct the use of the world’s remaining burnable fossil fuels—whether toward the further growth of conventional manufacturing and transportation, or toward the build-out of renewable energy-based generation and consumption infrastructure. Only such an authority could globally prioritize and coordinate sectoral shifts (in agriculture, transport, manufacturing, and buildings) to reduce fossil fuel consumption as quickly as possible without reducing economic benefits in unacceptable ways. But in the absence of such an international authority, the onus of this work will fall largely upon nonprofit environmental organizations and their funders, along with national and local governments. One way or another, it’s time to make a plan—as comprehensive and detailed as we can manage—and run with it, revising it as we go. And to “sell” that plan, honestly but skillfully, to policy makers and our fellow citizens.